of books that will benefit your green lifestyle immensely. Each book “greens up” a different aspect of your life ie. your home, your office, your bank account, and your activities. You can learn simple ways to be more conscious in all areas and hopefully improve the quality of our environment not only in your personal space but in your community as well. The Chelsea Green Guidesis the perfect gift for a new “greenie” or even better a disbeliever to prove to them how being educated about changing our habits can improve our environment greatly. A complete guide for making biking to work a safe reality for the beginning bike commuter. For those who live within biking distance to work, this book offers simple safety, bike-buying, gear-buying, and basic maintenance tips, as well as ways to best plan your route to and from the office. By biking to work, you can improve your physical and mental health, save money, avoid creating pollution, and contribute to friendlier cities. In the face of rush-hour traffic, biking is often faster than driving, too! 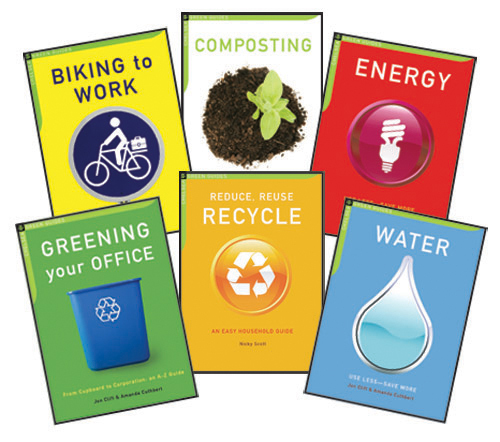 An A-to-Z guide for offices of all sizes, from energy use and better supply purchases to recycling and reusing materials, plus summaries of a range of renewable energy options, commuting techniques, and more. These tips help your workplace save money while reducing environmental impacts, and can boost employee morale in the process. Your choices for coffee, computer monitors, furniture, invoices, lighting, paper, stamps, and hundreds of other items can add up to a better world. Everything you need to know about composting, from the different containers available, to what to put in them, to how to use the results. Includes an A-Z directory of how to compost everything from ash to weeds; plus expert advice on how to compost in small spaces, bins, and wormeries, and getting your community involved. 100 energy saving tips for everything in your home or business. Includes suggestions on heating and cooling, lighting, cooking, appliances and much more. Also provides an overview on renewable energy options. This easy to use guide has the answers to all your recycling questions. Use its A-Z listing of everyday household items to see how you can recycle most of your unwanted things, do your bit for the planet, and maybe make a bit of money while you’re at it. 100 simple and effective tips for saving water, inside and outdoors of your home or business. Packed with practical ideas for your kitchen, bath, landscaping, and water using chores.